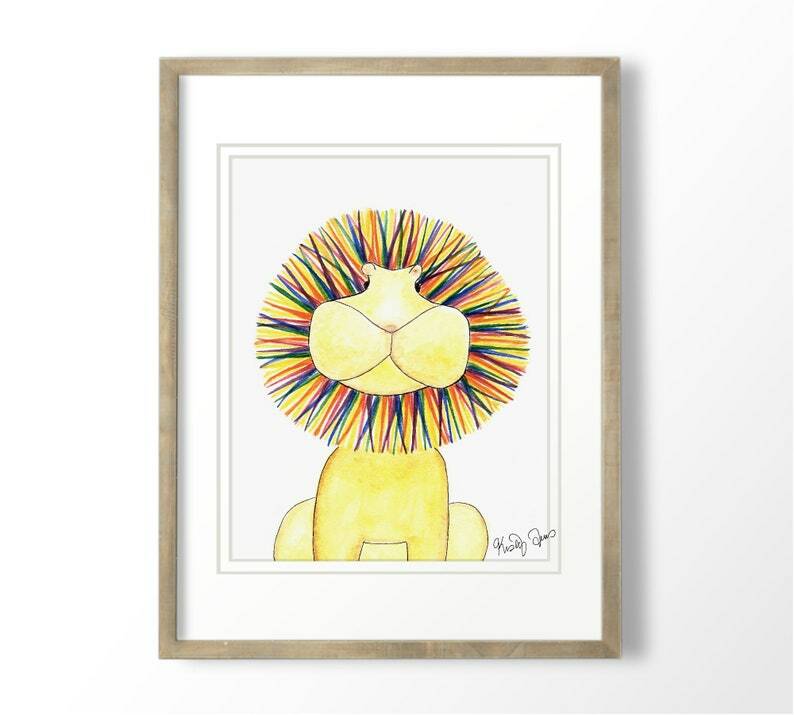 Lion Art print from my original watercolor illustration. This lion, the matching zebra, and elephant, were inspired by my daughter who loves to color everything in rainbow colors. Children love to see the world in bright primary colors! Red, orange, yellow, green, blue, and purple! Let the rainbow safari begin with this vibrant wall art, especially when paired with the rainbow zebra and elephant. Great in a playroom, nursery, or child's room! NOT ALL PRINTS ARE AVAILABLE IN ALL SIZES. Please choose an available size for this print from the drop down menu before adding to cart. All of my artwork is thoughtfully imagined, sketched, and hand painted by me. I scan, touch up my work to match the original, and print each print myself. You can be assured that the whimsical art in my shop that you choose for yourself, child's room, or as a gift is lovingly handmade from start to finish. All of my artwork is packaged in a protective sleeve and rigid packaging, mailed via USPS with a tracking number. In an effort to reduce waste, I package in repurposed cardboard.